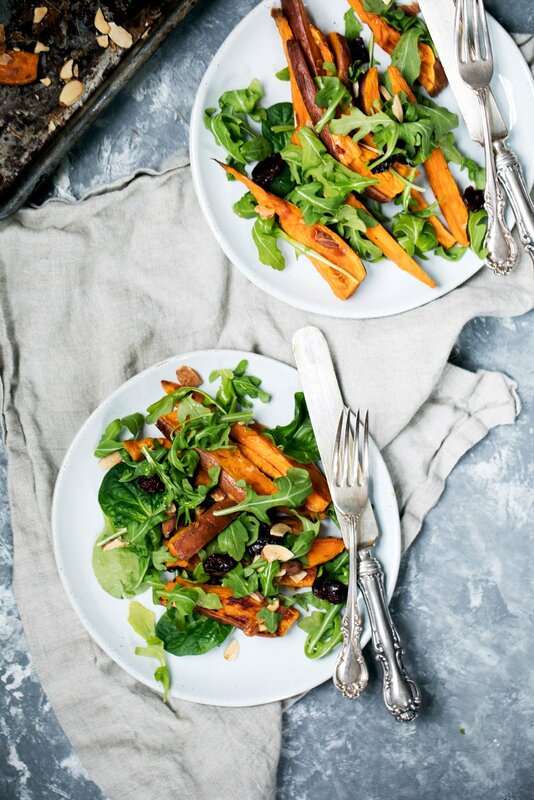 Roasted sweet potato arugula salad is a perfect lunch or appetizer. 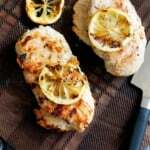 Topped with a light honey mustard yogurt dressing with a hint of gorgeous turmeric color. How are we all feeling after the long weekend? Relaxed and rejuvenated? Yesterday I went on a 3 mile run because I woke up with a massive wine hangover and needed some oxygen pumped to my brain. What? Just being honest over here… the best way to cure a hangover is a little bit of exercise. During my run, I remembered how I used to run outside all the time. How much I used to love putting in my headphones and running into the wind by the lake in the city. And of course, how empowered running made me feel. I’d dodge around the lake power walkers, jam out to my favorite playlists and sweat out anxiety. Being outside running is a high like no other, but it also takes me back to when I forced myself to run because I couldn’t do any other exercise or how when I used to only run because I wanted to burn the maximum amount of calories. Sometimes I have a love/hate relationship with running. And that’s OKAY. That’s just me. 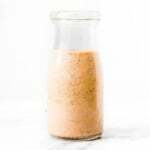 What I’ve realized as I’ve gotten older and further into my healthy journey is that no one should force you to exercise a certain way, or eat certain foods. Forcing yourself to do something will never make you love it, because you can’t force passion or liking a certain exercise. Simply put: If it doesn’t give you happiness, let it go. Same goes with food. I used to force myself to eat certain foods on a consistent basis because I thought it was necessary to get a certain amount of veggies in. Or I would make myself eat other ‘substitute foods’ instead. By substitute foods, I mean a yogurt brownie (remember those?) instead of a real brownie. Or cauliflower instead of rice. Now I don’t mind these foods at all and they are perfectly acceptable, I just never want to feel like I’m forcing myself to have one thing over the other because it seems ‘healthier’. You see, what’s ‘healthier’ is all relative to your mindset. And often our minds are consumed with an overload of health information that confuses us, our relationships with ourselves, food and our bodies. What’s healthy is when you love yourself first and foremost. Because self love will always be greater than having a six pack. Sometimes we just have to learn how to be. Be present. Be grateful. Be human. None of us are perfect. The older I get, the more I am grateful to even have the luxury of putting food on my plate. I’ve also realized that you can make food choices that shouldn’t be forced on you. Eat a donut with a girlfriend. Enjoy a salad for lunch if you want to. Balance your choices. You’re always going to feel like you are teetering from one way to the other, and maybe that’s how it’s supposed to be. I’ll admit, I wasn’t expecting to write much in this post, but the words just kept flowing. And now here we are, somewhere within a deep convo and a delicious plate of salad. By the way, this is a salad I absolutely love. A salad I want to eat every day because it’s incredibly delicious, fresh and both sweet and savory — just the way I like it. 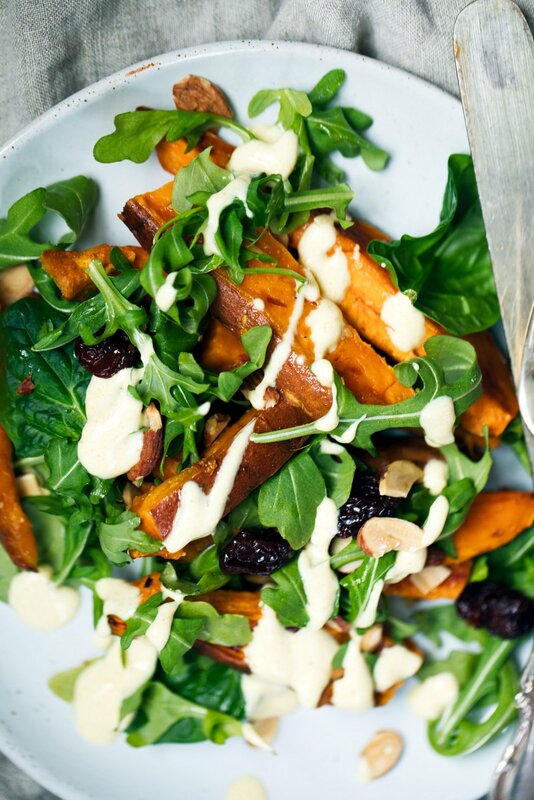 Roasted sweet potatoes with zesty arugula, almonds, cherries and a light honey yogurt turmeric dressing? It’s a salad I’ll come back to without feeling forced. It’s a salad that makes me feel good, you know? One that doesn’t take much effort either. Those are always the best kinds of salads. I hope you get a chance to try it out, but most of all I hope you never have to force yourself to be a certain kind of healthy. Find self love first. xoxo. Have a happy week ahead. I love you guys. Preheat 400 degrees F. Line a large baking sheet with parchment paper. 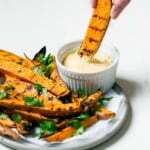 Add sweet potato wedges to the pan and drizzle with olive oil. Add minced garlic, salt and pepper and toss well to combine. Bake wedges for 20-30 minutes, flipping halfway through, until tender and golden. While the potatoes are roasting, you can make the dressing: In a small bowl whisk together yogurt, dijon, honey and turmeric. 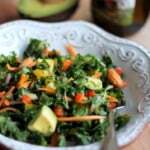 Thin the dressing out with a few teaspoons of water so that you are able to drizzle it over the salad. Place in fridge until ready to use. Once the sweet potato wedges are done baking, remove from oven and allow to cool for 5 minutes. 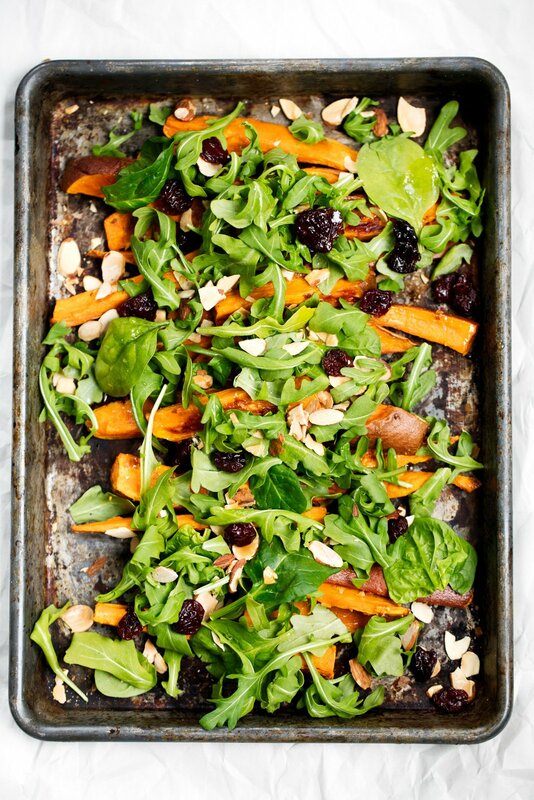 Add fresh arugula on top, along with cherries and almonds, then drizzle with dressing and serve immediately. 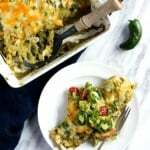 Serves 2 and makes a wonderful lunch or appetizer. Also great when served cold! If you want to reduce the sugar in the recipe, simply reduce the amount of dried cherries to 2 tablespoons or leave off completely. 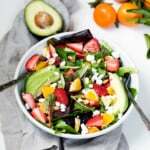 28 Responses to "Roasted Sweet Potato & Arugula Salad with Turmeric Honey Mustard Yogurt Dressing + thoughts on self love"
This deliciously balanced salad suits your wise words so well! Grateful as well to have a better perspective as I get older, I spent ENOUGH time feeling insecure and restricted about what I put in my body. Right?? Such a freeing feeling to gain this perspective! Thanks for your note, Meredith! Very well said Monique!! We need to treat ourselves kinder and with more emotional respect. It’s an easier mindset as I get older for sure. 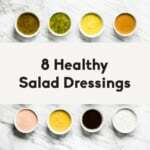 That dressing looks amazing! The salad has all my favorites too. I’m out of cherries right now, time to stock up! Pinned for later, Thanks! Hey Monique! I A) absolutely this post and all of your words hit home for me. I am a runner and have been to that place with my running too, when i used to force myself to run to lose weight. Now i run for different reasons completely. I run because i love the feeling of being free and alive and i mever force myself to go farther than i need to. B) i love the sounds of this yummy salad and cant wait to make her!!! Hi Natalie! So glad you’ve found that freeing feeling 🙂 Hope you love this salad, too! I made this salad and your almond flour strawberry shortcake today & both were soooo delicious:) Thank you!! Made this today and it is fantastic. I used reduced sugar dried Craisins in place of cherries. How do you toast your sliced almonds? Forcing yourself to do something will never make you love it, because you can’t force passion or liking a certain exercise. So happy to hear that, Paula!